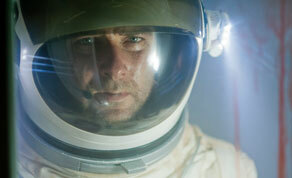 Liev Schrieber in Ruairí Robinson's 'Last Days on Mars'. Irish director Ruairí Robinson’s feature-film debut ‘Last days on Mars’ has been chosen for the prestigious Directors’ Fortnight at the Cannes Film Festival, which takes place next month from 15-26 May. Produced by Fantastic Films and Qwerty Films with Irish Film Board funding, the film stars Liev Schrieber in a tale of astronauts sent to collect specimens on Mars who encounter a terrifying force. Mr Robinson described his delight at his inclusion in the Cannes line-up. ‘Having my film selected for Directors’ Fortnight is very exciting and a wonderful endorsement of the creative talents of my cast and crew. My head just exploded,’ he said. James Hickey, Chief Executive of the Irish Film Board applauded Mr Robinson’s arrival as a major international director. The Irish Film Board previously funded Mr Robinson’s Oscar-nominated short film ‘Fifty Percent Grey’ in 2002. ‘Last Days on Mars’ was shot by award winning Irish cinematographer Robbie Ryan and scripted by Clive Dawson, with post-production handled by Irish VFX house Screen Scene. Previous Irish films to be selected for the Directors Fortnight in Cannes include Lenny Abraham's ‘Garage’; ‘All Good Children’ directed by Alicia Duffy; and ‘The Other Side of Sleep’ directed by Rebecca Daly. A total of 23 feature films will screen as part of the Director’s Fortnight line-up, which is non-competitive, but debut films - including ‘Last Days on Mars’- are eligible for the Camera d’Or prize. Other famous directors to feature as part of the Directors’ Fortnight in the past include Sophia Coppola, Werner Herzog, Michael Haneke and Spike Lee.